This is the only known picture of my dad as a child. He grew up on a homestead near Lincoln, Kansas. The family story on this homestead was that it was land given to my dad's grandfather in payment for fighting in the Civil War. Some people actually know their great-grandparents...my great-grandfather was part of the war between the states. This land payment was in an area of Kansas known as "Stone Post Country". There were so few trees in the area that fence posts were cut out of limestone. If you look closely, you can see one of those stone fence posts in the background of this picture. 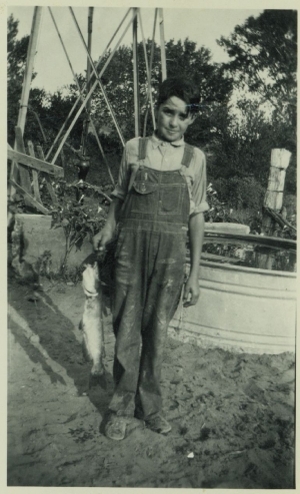 Dad always liked to fish, although he never was too fond of eating fish. I suspect this was a picture of quite a good catch, and hopefully a good day. My dad's father was a writer who traveled around collecting the stories of the original settlers of Kansas. My favorite of these stories is the one he recorded that was told by his father (the before mentioned war veteran) about witnessing the killing of the last buffalo in Kansas. This author, my grandfather, was not interested in the hard life of wheat farming in "Stone Post Country", and eventually the homestead was lost. I can't, or don't really want to think about how hard of a life my dad and his sisters had on a failing farm.... and then they survived the Great Depression. Many of us did not have the childhood we wish we could have had...but these kids really did not have it easy. The hardships of childhood can shape the adult life that then affect the next generation...and it can just go on for generations. My dad served in the Air Force in World War II. He was an electrician, and worked construction jobs before OSHA...and he had the scars to show for it. My dad did his best to be a better father than his father was. He never deserted us to follow his own interests. Here is a picture of me and my younger brother in our fabulous inflatable swimming pool. My dad showed us how to put our faces into the water and blow bubbles. When the pool developed leaks, he patched them. Dad died Monday morning, just a few days short of his 92nd birthday. I wish he could have had a happier life with less hardship. How precious that your Father was with you for so many years. These pictures are wonderful. I think I see the limestone post on the back right (?). In the pic of you children in the pool, I see that the stroller is the very same one that my Mother pushed us five children around in. Thanks for sharing memories of your Father with us. Linda, I'm so sorry to hear of your fathers passing. I wonder if our families knew of each other way back when. Both of my grandparents and a great grandparent grew up around that area. 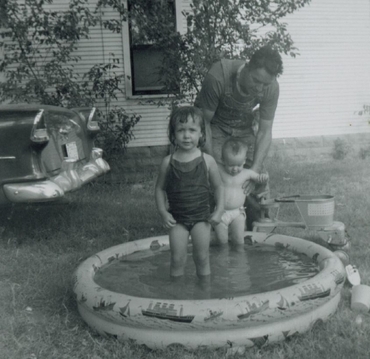 I've seen photos of my mothers family when they bathed in a large metal tub in the back dirt yard. Those photos are priceless. I am sure you will treausure them as we do.